At Sunshine Weddings Spain we are always busy sharing with you news about past weddings and our fantastic wedding suppliers, but what our future brides and grooms really want to know is more about the people behind the weddings. Our planners! Scott is the main man behind Sunshine Weddings Spain and set up the company 13 years ago. We met up with him to ask him all about life as a wedding planner in Spain and what things make him want to celebrate. Hi Scott. Thanks for your time today… Sunshine weddings is one of the most established wedding planners in the south of Spain. So how long have you been a wedding planner? My first wedding was in 2002, so I am in my 13th year now and still loving every minute of it! What made you get into the wedding business? I have worked at all types of events and organizational roles since I was 16 years old. During 2001 I was asked by my sister, along with a friend who lived in Marbella, if I could help them both plan their weddings. After doing so I realised just how much I loved the whole experience. And as they say, the rest is history…. What is so special about Spain as a wedding destination? Firstly, of course, the weather is fantastic as Southern Spain in the country furthest south in Europe, in fact we can see Africa from our window! We get about 300 sunny days a year and very little rain. Also the accessibility to local airports is great, especially Malaga and neighbouring Gibraltar. We get many northern European couples marry here because of the short flight times from northern Europe, with often very competitive prices. And not forgetting the great selection of wedding venues – whether you want a wedding by the sea, in the mountains, at a flash hotel or a secluded villa, the South of Spain has it all. List three things every couple should know before marrying in Spain? 1. Bring sun cream and not an umbrella. 2. The cost of a wedding in Spain can be far lower than the UK. 3. The biggest regret of past bridal couples has that they have wanted to stay for a longer period after their big day. So make sure you book enough time here! Why is having a wedding planner so important? Whether your wedding is in your home town or a destination wedding, there is a great advantage of having someone experienced in a planning capacity. They will discuss details with you about things that you would never have considered. Planning your wedding is busy enough without having to worry about the timings and suppliers, so as long as a couple gives all their requests to the wedding planner, they will ensure the smooth flow of the day and night without any stress to the couple and their guests. That’s easy, hearing from the bridal couple that they are having the best night of their lives. Nothing beats that! What’s your favourite memory of a past wedding? I always love the first glance of seeing the bride just before she walk down the aisle. It’s really emotional we have gone on a journey together and that’s the final step before ‘I Do’. I always feel so lucky to have been involved in their special day. Why do people choose Sunshine Weddings over other planners? 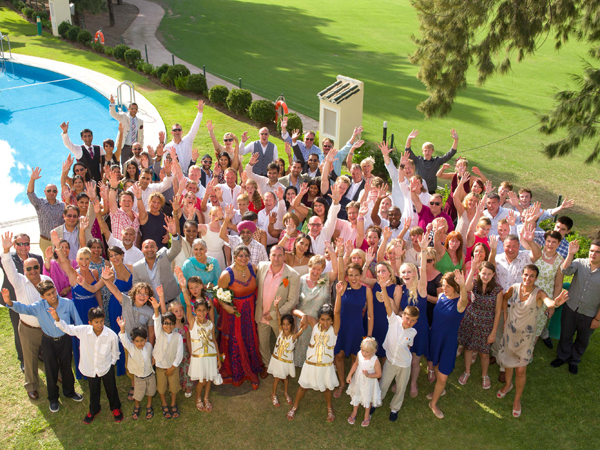 Sunshine Weddings Spain is probably the most long standing wedding planning team in Spain so we have lots of experience with all venues and providers. Our partners trust us and know that working with us is always a seamless and fun experience. Plus having spent over a decade in London, the Sunshine Weddings Spain team are experts at planning weddings with clients via email, Skype and telephone and understand their needs perfectly. We also have a UK office that helps to meet with brides and grooms during the planning process, ensuring they can keep their traveling to a minimum and still receive our expert services and dedicated attention. You get to travel a lot with work. So when you are not working, what’s your favourite part of the world and why? I love the Caribbean during the winter months of December and January. Whilst working there over the last 4 years I have explored many of the islands and overdosed on coconut water and swimming in crystal clear waters. The perfect way to relax after a crazy six month wedding season in Spain!